MARTINSBURG – After witnessing the hardships of children in El Salvador in 2004 and 2005, Diana Wall and her husband Danny returned to Martinsburg with a heavy burden on their hearts for children that were hungry and in poverty. Diana went into Burke Street School to see if there was a need there. in El Salvador,” she said. Diana said she was moved by a story of one little girl that cut the liner of the pockets of her coat to slip in additional rolls of bread to take home. The Walls decided to take matters into their own hands. They started by feeding 20 children at just one school in 2007. Today, they help more than 900 children per month in 30 schools located in Berkeley and Jefferson counties through Community Combined Ministries with a program called Kidz Power Pacs. Many children in Berkeley and Jefferson counties receive food each Friday to take home to eat over the weekend. Then they return to school Monday for breakfast and lunch. Just in the last month, 30 new children were added to the roster for weekend food. Teachers and staff at the schools identify children and families that are in need. This ensures that the food is going to those that would most benefit from it. After the parents sign a form, agreeing to receive it, the food is given out in a discreet way in order to not draw attention, or cause embarrassment to the students. “If a family is really struggling, this is just something that we offer, another way of helping. 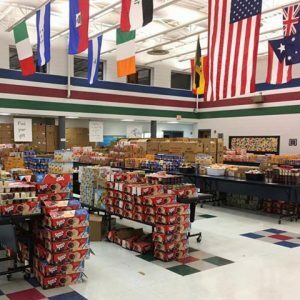 Our poverty numbers are high here, so all students receive free lunch and free breakfast,” said Stephanie Schminkey a counselor at Eagle School Intermediate. According to the federal poverty guidelines, a family of four making less than $24,250 is below the poverty line. In some cases, grandparents are now rising their grandchildren on a limited, retirement income. Other families, working two jobs, struggle with high rent and a raising cost of living. This sometimes affects a family’s food budget. In other cases, children are abused or neglected. The logistics for such an operation requires hundreds of volunteers, sponsors and donors, a 20- foot U-Haul truck, storage, countless bags and boxes, help from school teachers and counselors, thousands of man-hours and, of course, money. Every detail is planned out. The ways in which the food is purchased, picked up, laid out, packed, counted, sorted and distributed have all been tested for the most efficiency. All food is purchased in bulk to make every penny count. Volunteers from Berkeley Community Pride recycle even the waste that is generated from all of the food’s cardboard packaging. The waste is hauled to Quad Graphics where it is shredded; and a check from the sale of the cardboard is sent back to Kidz Power Pacs. Over 100 people showed up to help on processing day. Food is also distributed throughout the summer months to the same children. Diana Wall said that sometimes parents send a note in stating: “Please stop sending the bags home. We’re okay. Bless another child” at which point the food stops going to that family. They not only help with food, but also are planning a Christmas party for Dec. 11. Wall said they are expecting as many as 300 children and are looking for volunteers and sponsor gifts. Community Combined Ministries can be reached at 304-268-8778.